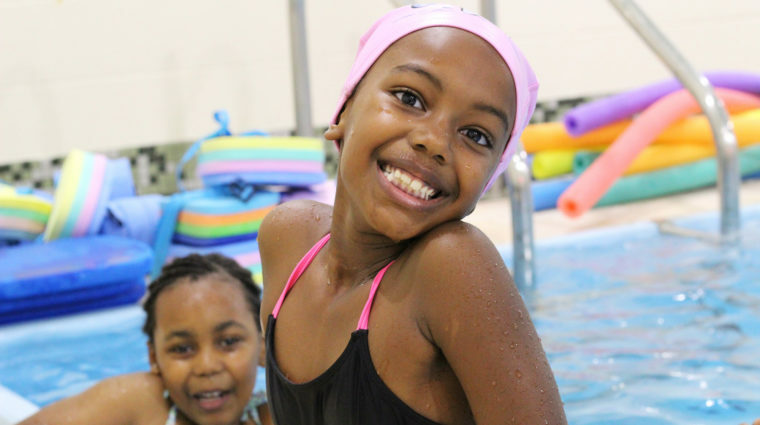 Evanston, IL – Evanston Swims!, a community collaboration that teaches water safety and swim instruction to Evanston second graders at no cost to their families, recently launched its sixth official season. Approximately 230 children have registered. Through Evanston Swims!, second graders in Evanston/Skokie School District 65 have access to swim lessons on half days of school throughout the year. They either bring a sack lunch or receive a lunch at school and then board a bus to their swimming sites, which include YWCA Evanston/North Shore, McGaw YMCA, Presbyterian Homes, and Goldfish Swim School. “Goldfish Swim School is a new partner this year and we’re so pleased they’re part of Evanston Swims!,” said Miller. But community support doesn’t end there. The annual Great Lake Plunge open-water swim raises funds for the program. And chaperones and instructors come from all corners of Evanston and include parents, Masters swimmers, District 65 middle schoolers, and others who want to be involved. The next session of Evanston Swims! is December 5, and, according to Miller, the organization currently is looking for more chaperones, particularly male chaperones. To learn more about Evanston Swims!, to volunteer or to make a donation, visit www.ywca.org/evanstonswims or email evanstonswims@gmail.com.